As I left the theater after the screening of the documentary Taking Root: The Vision of Wangari Maathai, her words kept running through my mind. 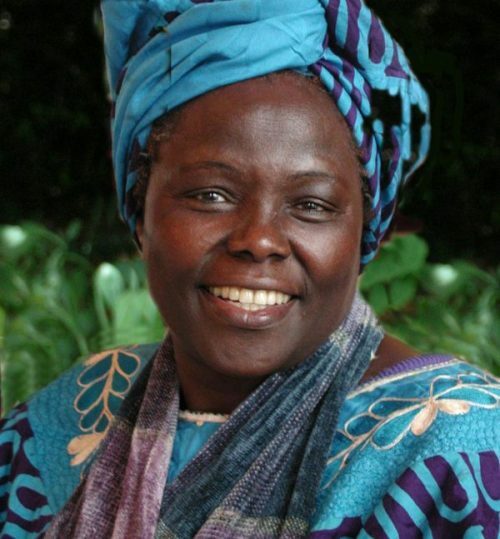 The only thing I had known about Wangari Maathai before viewing the film was that she had won the Nobel Peace Prize. I had no idea of the horrors and violence she had personally endured, as well as the depth of her strength and perseverance in pursuing her life altering work, which improved the lives of generations of Kenyans, helped end a dictatorial regime, and also healed the damaged environment. Wangari, born in rural Kenya in 1940, attended college in the US and Germany, and was the first woman in East and Central Africa to earn a doctorate degree from the University of Nairobi, She went on to become chair of the Department of Veterinary Anatomy and an associate professor at the university. She also belonged to the National Council of Women of Kenya (1976–1987) and served as its chair from 1981–1987. In this role, she traveled back to rural Kenya, where she heard stories of hardship experienced by local women. They told her that due to the country’s massive deforestation program, they had to travel longer and longer distances for water and firewood. Their soil was eroding, and their children were suffering from malnutrition: “As long as the resources are not adequate, as long as the resources are not being managed properly, as long as the resources are not being shared more equitably, we will be threatened” (Wangari Maathai, Taking Root). After considering these hardships, she came up with a fairly simple solution to this complex problem—teach the women how to plant trees: “Trees provide shade, prevent soil erosion, supply firewood and building materials, and produce nutritious fruit to combat malnutrition” (Wangari Maathai, Taking Root). The Green Belt Movement took root and quickly grew from a small local effort into a political force to be reckoned with. Under the oppressive dictatorship of Daniel arap Moi, group gatherings were prohibited. 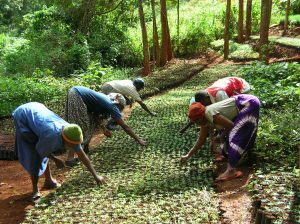 However, every time the women worked to plant trees, they circumvented this edict, and as they became more educated regarding the root causes of their own families’ suffering, they began speaking out—actively advocating against deforestation and other harmful government policies: “You raise your consciousness to a level where you feel that you must do the right thing, because it is the only right thing to do” (Wangari Maathai, Taking Root). The more empowered the women became, the more the corrupt Moi government viewed them as a threat. On many occasions, the group was met with a violent response from government forces. In February of 1992, Wangari organized a meeting between a group of elderly mothers trying to gain the release of their sons who were being held as political prisoners, and Attorney General Amos Wako, who summarily dismissed the women: “In response, the mothers set up camp in the Uhuru (Freedom) Park that was located across from several parliament buildings. There, they staged a hunger strike and waited for the release of their sons. On March 3, the Moi government decided to forcibly disperse the demonstrators. Government police forces beat protesters with batons, fired gunshots into the air, and hurled tear-gas into the tent where protesters were gathered. To ward off the police, three of the protesting mothers stripped their clothing, shook their breasts, and shouted, ‘What kind of government is this that beats women! Kill us! Kill us now! We shall die with our children!’ The police forces responded by turning away and leaving the scene. According to Maathai, the tactic of disrobing was particularly effective in stopping the police because, ‘In the African tradition, people must respect women who are close to their mother’s age, and they must treat them as their mothers. If men beat mothers, it is like sons violating their mothers, and the mothers respond by cursing them. And they curse them by showing them their nakedness’” (Global Nonviolent Action Database). Nonviolent protests continued throughout the 1990s. In 1999, Wangari was the first person attacked when she and a group of Greenbelt Movement supporters attempted to plant trees in the Nairobi forest in an area that had been destroyed by real estate developers. She was hit in the head with a club, and hospitalized due to loss of blood. The wound required several stitches (University of Pennsylvania African Studies Center). Finally, in 2002, all of the group’s efforts bore fruit, and Kenyans elected their first democratic leaders. Wangari served in the new Parliament and was appointed Assistant Minister of the Environment and Natural Resources: “Today there are more than 4,000 Green Belt nurseries throughout Kenya that generate income for 150,000 people, and 51 million trees have deeply altered the physical and social landscape of the country. The Green Belt Movement has also started programs teaching women about indigenous foods, income generating activities, AIDS, and self-empowerment” (Taking Root). 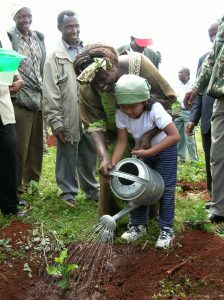 Wangari Maathai plants a tree with flimmaker’s daugther in Aberdare Mountains, Kenya. For weeks after attending the screening of Taking Root, I kept thinking about this one woman’s ability to enact change on a local level that eventually shifted an entire nation. One woman was the catalyst. There are so many days that I feel overwhelmed with the chaos swirling around me as a citizen of the United States. The current administration is determined to destroy our democracy. Every day citizens who are already oppressed (racial minorities, religious minorities, women, members of the LBGTQ community) are losing basic human and civil rights. Environmental protections put in place to save our planet have been systematically dismantled. Relationships with other countries around the world have been eroded. What can one person do to begin to turn the tide? What can I do? I can step up in my own community in order to support those who are working to make a difference. I can work to ensure that the open minded candidates running for office in my own state get elected—those who want to create equality for all and who care about saving our dying planet. I can educate myself and others in order to create empathy and greater understanding and acceptance of differences. Our individual decisions and efforts matter. How we treat each other and our planet matters. The efforts of one person can make all the difference. Be that person. “It is the people who must save the environment. It is the people who must make their leaders change.